The initial premise started with this question – what if modern civilization crumbles not in one big implosion because of a single major disaster but slowly, as a number of smaller disasters gradually overwhelm the capacity to respond and deal with them? This ‘slowpocalypse’ presupposes an eroding of the foundations of modern society, those the world relies on in times of crisis. What if the government wasn’t capable of dealing with threats to national security? What if the police and firefighters and EMTs were unable to cope with how bad things were getting? What if the economy couldn’t support the population or the infrastructure anymore? What if people could no longer depend on the energy or the transportation or the communications the modern world requires to function? 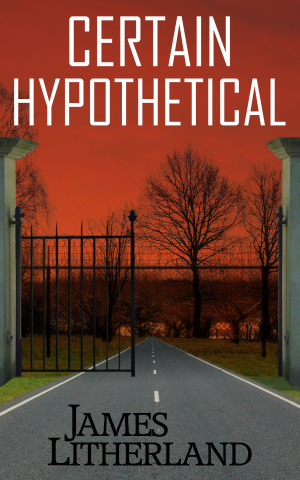 So Certain Hypothetical starts in a world that has been gradually losing the battle with the forces weakening and damaging modern civilization, with each new calamity adding to the burdens of a system already overwhelmed. Although these effects are being seen throughout the world, this story focuses on the United States. And this ‘slowpocalypse’ is prolonged and painful in part because of the heroic efforts of Americans to fight the rising tide of destruction. Not a bad thing in itself, but at some point it becomes (or has become) futile. That’s another aspect of the premise – that there’s a turning point beyond which all the things people try to do to reverse the decline of civilization become useless because the decay has already spread too deep, when the collapse of modern society has become inevitable and any efforts from then on only serve to delay it. But what if some people chose to fight – not to rescue a civilization that is crumbling, but to start building a new, stronger society? Not knowing if or when it may be too late to stem the tide of destruction, plans are laid and preparations made for the worst-case scenario – that it all falls apart. So people are ready to start building anew. But before they can do that, they’ll have to survive the passing away of the old. That’s a key part of the actual premise for the story – that took it from vague musings about a potential apocalypse to something a little more definite, but it was still barely the beginning of an idea. It was enough to be my starting point.